Long ago, in the days of the first kings in thenorth, there were seven devils. In a land where gods walk on the hills andgoddesses rise from river, lake, and spring, the caravan-guard Holla-Sayan,escaping a bloodily-conquered lakeside town, stops to help an abandoned childand a dying dog. The girl, though, is the incarnation of Attalissa, goddess ofLissavakail, and the dog a shape-changing guardian spirit whose origins havebeen forgotten. Possessed and nearly driven mad by the Blackdog, he flees tothe desert road, taking the powerless avatar with him. Necromancy, treachery, massacres and rebellions,gods dead or lost or mad, follow hard on the devils’ heels. But it is Attalissaherself who may be the Blackdog’s—and Holla-Sayan’s—doom. And perhaps some of the devils are free inthe world, and perhaps some are working to free themselves still. Thanks to Pyr for sending me a copy of thisbook to review. Whilereligion is often found in epic fantasy, rarely is it the main focus of anovel, as it is in Blackdog. Furthermore,it’s even more rare to find an epic fantasy book that is a stand-alone ratherthan part of a long series or trilogy. 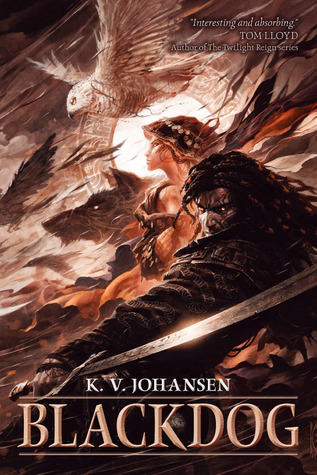 While the fact that Blackdog is a stand-alone might turn some epic fantasy fans off, itis rather refreshing to read a fantasy on an epic scale that is containedwithin one book and has a definite beginning, middle and ending. Johansen’sworld building reminds me a bit of Erikson’s in his Malazan series. The world is large, intricate and sprawls intolands that are just hinted at. It has a rich history which will keep the readerinterested and yearning to learn more. Furthermore, the gods are steeped inthat rich history and add an interesting dimension to both time and place aswell as some interesting complexity and cultural nuances. Thegods in Blackdog are also somewhat reminiscentof Erikson’s Malazan series in thefact that they are actual beings that can be interacted and spoken with ratherthan being some vague idea that cultural nuances are based on. In fact, many ofthe cities and towns seem to thrive based on the health and power of theirlocal god. For example, a few of the gods readers will meet in Blackdog are old and almost decrepit dueto the fact that they had been long forgotten, or only worshipped by a selectfew. As Tamghat, the warlord antagonist, expands his power, the gods begin tolook incredibly human. They fear and anticipate just like humans would andtheir reaction to events directly and profoundly affects the communities theyare anchored to. Attalissais an interesting character to follow, as she is the lake god who is forced toflee as a young girl and grows up as a human child in a caravan travelingsomething similar to our Silk Road. Due to this shockingly human upbringing faraway from her base of power, her coming of age tale is far different than you’dexpect from a goddess. The same can also be said of Holla-Sayan, who spendsmuch of the book locked in an inner struggle with the Blackdog. WhileBlackdog is primarily the tale ofAttalissa and Holla-Sayan, it doesn’t focus solely on them. There are plenty ofwell-developed secondary characters to keep anyone entertained. The onlyproblem with this is that due to the span of years covered and the epic sizedplot and world, some incredibly interesting characters with stories that couldeasily be expanded on seemed to fade into oblivion quickly and unfortunately. Blackdog is interesting in the fact thatJohansen uses a lot of interesting internal dialogue throughout the book asmany of the characters are either wrestling with insanity or are possessed.Despite these struggles and possessions, the characters all retain their uniquevoices and individuality throughout without allowing the reader to ever getconfused with who is who, which is no small feat. Namingconventions in Blackdog might confusereaders a first, but they are well thought out and give the reader an importantsense of the world’s culture, as most characters seem to take on the name oftheir local gods somehow. For example, a priestess of Attalissa is namedAttavaia and Holla-Sayan carries his local god Sayan’s name. Even places followthis pattern. Attalissa’s lake is named Lissavakail and the goddess Serapresides over the city named Serakallah. This, as other reviewers have noted,shows off Johansen’s master’s degree in Medieval Studies. These subtle detailspeppered throughout the book really help the believability of this multifacetedAsianesque world. WhileI rarely mention cover art in a review, I feel like the cover art of Blackdog particularly supports the book.It’s artistic, ethereal and mysterious without being over-the-top. It causespotential readers to wonder what it’s all about, setting the perfect tone andattitude before the reader even cracks the spine and Johansen carries thatthrough to the last page. Everything about Blackdogis measured, deep, planned and thought out. An incredible world and wonderfulcharacters are created in this tome, which I woud love the author to expand onin the future. Despite some abrupt character entries and exits and someconfusing names, Blackdog is a realgem fans of epic fantasy should check out. Next PostDiscussion: What author would you dine with?